Ordinarily, when we think about the lies we tell, they are usually the ones we tell others. We don’t often stop to take a hard look at the lies we tell ourselves though. 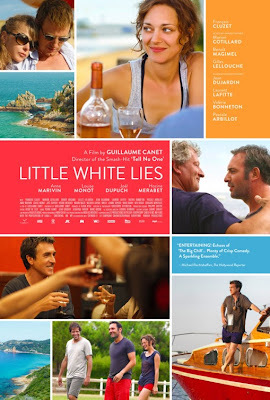 French actor/director, Guillaume Canet’s LITTLE WHITE LIES, his first film since his international hit, TELL NO ONE, is here to ensure we finally turn that mirror inward. Every summer, Max (Francois Cluzet) invites his friends, including Marion Cotillard, to his country home to vacation. When one of the gang gets into a serious accident right before the trip is to take place, the remaining members can’t seem to keep up their facades any longer. While this may not make for a very pleasant summer, it does make for an awful lot of solid drama. How many sheep would you give Little White Lies?